"The pleasure in Horowitz’s story comes from its rhythmic, patterned text...and its gentle understanding of how a little misunderstanding can blow up into a big rift. 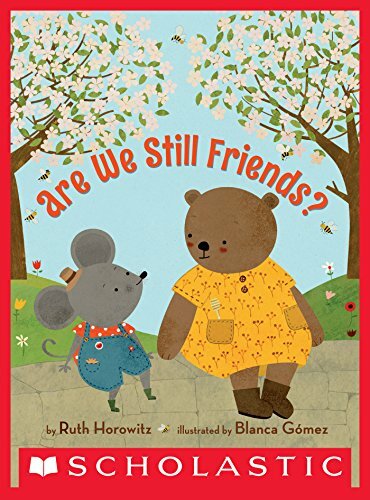 A sweetly humorous story for the friendship shelf." ​"Without dismissing their characters' emotions, Horowitz and Gomez alert readers to a core truth: whatever our trivial disputes, the world keeps spinning." "A good read-aloud story for early elementary classrooms." Beatrice and Abel live side by side. Abel grows apples. Beatrice raises bees. They're the finest of friends, indeed. And so are the bees and the trees. Until...one spring morning -- ZING! -- a bee stings Abel on the nose. WHEE HEE HEE! he cries out in pain. But Beatrice only hears the silly sound, and laughs. And that makes Abel angry. Can their friendship survive the misunderstanding? I was first inspired to write ARE WE STILL FRIENDS? years ago, when I lived in Vermont. Our family loved going apple picking, and noticed that the orchards often sold honey along with the fruit. The interdependence of apple trees and bees struck me as the perfect opening for a story about ecology, teamwork, and the art of saying I'm sorry. I'm thrilled to have been paired with artist Blanca Gomez. Her illustrations are funny, warm, and filled with clever details that tell their own story.